This looks yummy. I love craisins too! Didnot know they came in cherry. I can't wait to try this...sounds very yummy! My mother makes this slaw but didn't have a recipe. I will treasure this one. Looks so healthy. I love salads like this:) Can't wait to try it. This looks so good Rhonda. It is definitely a healthy keeper! Love those Craisins. 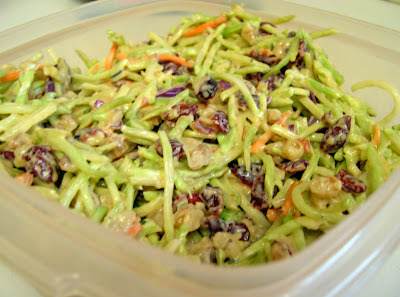 It really is a delicious healthy alternative to the ho hum iceberg lettuce salads! I love the vidalia onion salad dressing!! I'm such a fan of salad. This is bookmarked! Walnuts make everything better :-) This sounds wonderful, thanks for sharing. A similar recipe is a favorite of ours -- only I use golden raisins and cashews. But I always have an empty bowl when I make it. It is a good recipe! Yum. I just discovered that yummy Vidalia dressing recently. Really good stuff! just reading this post has made me feel healthier, I can't imagine how great I'll feel after I actually eat it. I'm definately giving this a try over the weekend. Hi Rhonda - I got the "lifter thingy" at Wal-Mart. It was one of the items inside a kit for canning/preserving. The kit included the jar lifter, a wide mouth funnel, the magnet tool, and a tool to measure the head space at the top of the jam jars. I think the kit was under $5. I make a salad with broccoi slaw and ramen noodles. I have never tried the Kraft vidalia onion dressing. I'll have to try this. I do like the crunchy. It looks pretty ... nice and colorful! It would be fun to try two versions: yours and Martha's (from comment above) and let guests do a comparison taste test. 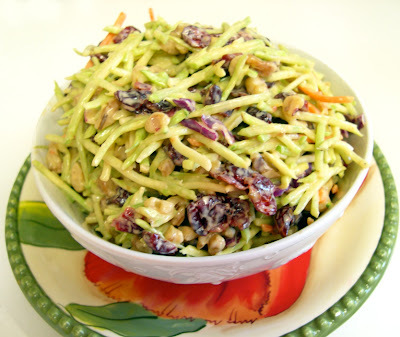 Your slaw recipe is pretty and colorful. I try to keep brocolli slaw on hand to use in stir-fries. It can save a lot of chopping. I hope you are having a wonderful day. I love broccoli slaw. I love cranberries. I always have a bag of these in the cupboard. I put them in cereal, salads, sauces. Where I live there are so many cranberry farms. They flood them every fall to collect the floating berries. Fun to see. Oh yes sometimes I even love a crantini. Looks great! I love recipes that are both healthy and delicious! OK so now you have made me starving! This dish looks amazing! Thanks so much for dropping by Beach Vintage and leaving a comment. I like broccoli, so I know I'd love this! YUM!!! LOVE slaw... I make one with cabbage, green onion, cilantro, red wine vinegar, corn oil, garlic salt and pepper!!! I like this recipe. 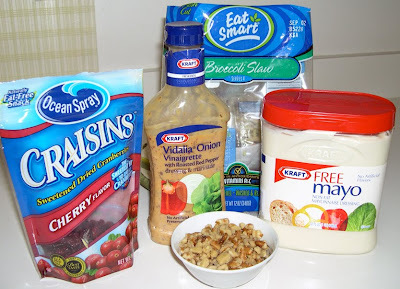 I keep craisins and walnuts in large packages from Sam's so it will be easy to put together. I haven't yet tried the Vidalia onion dressing so that is new to me. I have been mixing mayo, vinegar, and a little sugar for a slaw dressing. Your sounds better.